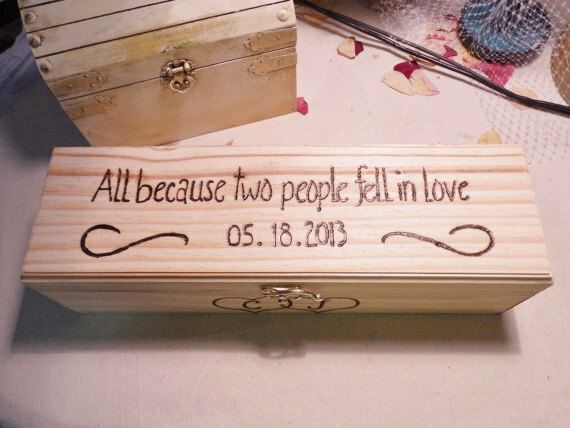 There are a lot of great ideas to help personalize your wedding ceremony and make it your own. Below are some of the rituals I have helped organize, but there are hundreds of great ideas out there. • Sand Ceremony (couple or family). A great way to portray that the bride and groom are uniting as one (while still maintaining their own individuality). Perfect for blended families as the kids get to participate and pour their own colored sand. • Love Letter and Wine Box. Although wine is the most popular, I have had couples substitute anything from whiskey to moonshine! Love letters are written in advance and then placed in a box along with the wine which is to be opened on a couples 5 year wedding anniversary. • Unity Candle: The most popular variation is to have the mothers light two of the candles and then have the couple light the center candle together as a symbol of their unity (while leaving the individual candles lit to symbolize that they still maintain their individuality). • Rose Exchange: Bride and groom exchange a single rose as their first gift to each other or as an alternative, they could present a rose to each of their mothers or to children in the newly blended family. • Blessing of the Hands: A special reading is presented that is substantive and emotional as you look at each others hands (usually after the vows and rings are exchanged). • Hand Fasting: A simple, traditional ceremony that involves tying of the hands together to symbolize the coming together of two people. • Tasting of the Four Elements: A very fun tradition that involves the couple tasting lemon, vinegar, cayenne pepper, and honey. It represents the sour, bitter, hot, and sweet times of marriage (followed by a celebratory taste of champagne if you wish). • Veil, Cord and Coins: Performed typically in Catholic and Filipino wedding ceremonies. Involves sponsors placing a cord and a veil on the bride and groom to symbolize unity. Coins are presented as a way of saying, "What is mine is yours and vice versa." • Tying the Knot: Both the groom’s mom and the bride’s mom can present the couple with a long piece of thick ribbon or cord (2 different colors, maybe your wedding colors) which you will tie in a knot to symbolize the union of the two families. • Bowl of Blessing Ceremony: Each guest is a given a small polished stone or seashell and they pause to offer a silent wish/blessing for happiness for the bride and groom. These are collected at the end of the ceremony into a "bowl of blessings" to serve as a daily reminder of the love and support offered by friends and family. • Ring warming: During the beginning of the ceremony, the wedding rings are passed amongst the guests and everyone holds them for a few seconds and offers their private blessing/wish/prayer.